Dice Masters Marvel Civil War Starter Pack - In depth breakdown — GamingWithSwag.com - Dads By Day, Gamers By Night. We posted a video yesterday of the Dicemasters Marvel Civil War Starter Pack which is currently available for pre-order. 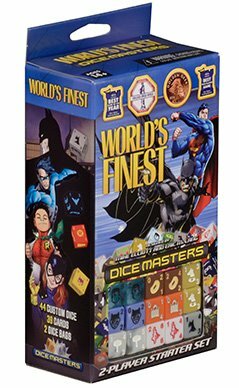 Unlike the Batman vs. Superman elements of the last DC set this one actually didn't build teams pitting the heroes against one another so the game play doesn't seem quite designed to emulate the movie. Today I wanted to post some pictures of the set and pick some favorites. I will start with the low cost characters which are a little heavy in this set which I appreciate as the low cost booster characters end up in high demand and can be tough to get enough dice to play as you might like. Black Widow returns as a nice low cost character and I would prefer the 3 cost version to keep knocking out my opponents 0 Fielding Cost characters. The 2 cost cards are cheap which is a stronger appeal than either of the abilities but I will give an edge to "Graduate of the Red Room". Wasp as a two cost can pack some early game punch, but I love the "Fast" functionality so "Pixie" would be my favorite of hers. If you like the "Driven Underground" Action card Wasp's global could make it impossible for your opponent to avoid instant death to their favorite character. Rocket can be had at 3 different costs and also has the "Fast" action. He is fragile, but with the 4 cost you may be able to use him to distract a defender to possibly allow a more powerful character through. My preference would be "Furball" which would be helpful regardless of your strategy although it should be noted that the global could easily be used against him for a knockout. Falcon is my favorite 2 cost and like his last version in the game he has a card that pairs well with a Sidekick based attack in "Wingman". Starting with this set they made two of the starter kit characters available as Super Rares and so we get 2 cards instead of the typical 3 for Cap'n and Iron Man. I find these cards very similar where both spin up automatically and can either do damage or heal when your allies go down. Pairing this with a cheap character that you sacrifice constantly could make them even more annoying which would be fun to experiment combinations. Iron Man is heavy on defense usage, and I would favor the 5 cost which makes him capable of defending against almost every character in the game. I like the Scarlet Spider cards that activate whenever your opponent fields a character, your preference on what perk you want from that action. Although, I think I like him more as a 4 cost. She Hulk's "Sensational" may be my favorite card. I love Overcrush, and if your opponent can't handle the attack they have to watch you get healed 2 points after taking it in the face. That card has to be reckoned with or the tide could turn quickly. Changing gears here are the Action cards from this set. I like both 3 cost cards, "Field Promotion", and the global abilities on "The Front Line"
Get a head start on scheming some combinations and teams and good luck pulling some rare cards from your boosters. Or if you get impatient waiting for this set to be released jump on the World's Finest set which was pretty awesome. Stay Tuned for a follow-up post with an in-depth look at some of the upcoming Marvel Civil War booster pack cards and dice.